Lyra’s neighbor can’t be for real. A man who makes her hormones stand up and scream every time she sees him. And he’s breaking through her reserve to invade her dreams at night. But Tarek Jordan is even more than he seems. A Breed Enforcer with a plan. First, find the Council Trainer he’s tracked to Fayetteville, Arkansas, and second, claim the woman next door as his own. She's fated to be his and his alone. He can feel it in his blood. Untl the danger that has shadowed his life suddenly casts a darkness over Lyra's as well. Now Tarek knows that he can’t wait any longer to claim the woman his heart and soul burns for. He has to tell her who he is, what he is, and what he wants. And Lyra will have to accept him as he is, on his terms, and now. Her life depends on it. The Breed Next Door originally appeared in Hot Spell. 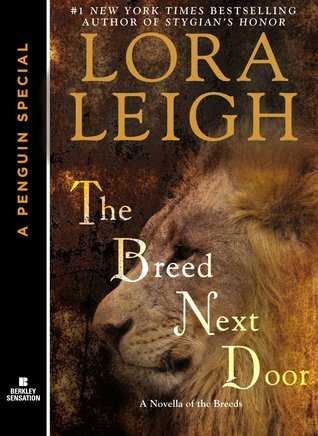 I went into this one desperate for another breed romance, I don't read the synopsis anymore, I just read. I'd been denying myself these book so I could read others on my shelves and man I'm so glad I got to read. As a shorter story in the Breed world Lora made this work by giving them a back story. As neighbors for the past six months they had been doing a back and forth dance, as Tarek learned about being free and Lyra just wanted him to stop killing her plants. I loved the interaction they had and how quickly they both got on the same page. Tarek was unaware of the strength and depth of his feelings and Lyra wasn't sure what she was going to do with a man like him. She was fun, funny and very spunky. I'm looking forward to seeing them throughout the series. Very quick read, with the mystery being solved quickly but enough tension that you wanted to keep reading. Fun quick slump breaker.